Humans were born to run. Since prehistoric times, our ancestors used this activity for numerous purposes. Nowadays, many people do it for very specific reasons, the most popular among which is to run to lose weight. If you’ve decided to take to this fun activity, you must be prepared for some difficulties at first. It takes a while to find the rhythm that would work for you and learn to get genuine enjoyment from running. In order to help you with the endeavor of an ideal shape challenge achieved through running, we’ve designed a running schedule for beginners. 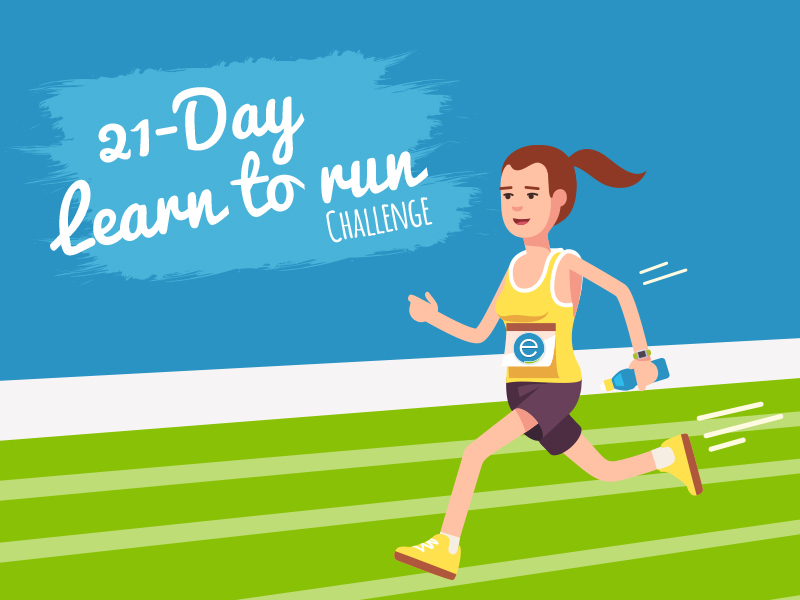 You’ll have to follow a 21-day challenge which requires you to run X miles a day depending on your level of progress. With every new day, the distance will be increased proportionally, but don’t get intimidated by that because your body will also adjust with time. We’ve also included various training to help your body prepare and do its best. So let’s look into more details about the best way to start running for a weight loss. You’ll see this abbreviation quite often in the running plan, and it stands for cardio walks. As far as the technique goes, you should do them at a pace that is slower than running but faster than casual strolling. Your arms, though, should still swing at the chest level as if you’re running. Cardio walks are necessary for every challenge runner because they keep you from overstraining your system while still keeping up with a fast pace. So now once you’re familiar with cardio walks, you’re ready to start with the running challenge for weight loss. Day 1. The first day try to explore what you’re capable of. Jogging for a ½ mile shouldn’t be too challenging, and it’s a good start. Day 2. CW – jog – CW, all for ½ mile. Day 3. This time you should take a break from running and work on your shape. Strength exercises are necessary to build up muscles that will assist you in running so make sure you include enough working out in between running sessions. Day 4. Rest. Sounds too easy? If you’re learning about running outside for the beginners, you need to understand that it’s a slow progress. Pushing yourself too far will result in exhaustion and you’ll eventually start hating running because it will make you unhappy. This challenge is aiming not only to help you to lose weight but also get keen on running so take a break when it’s needed. Day 5. Jog – CW – jog, again all for ½ mile. Day 6. Jog – CW – jog, but this time increase jogging distance to ¾ mile. Day 7. Close your first week of running with some yoga to stretch out your muscles. It’s important to listen to your breathing for the first week. After you’ve found the rhythm, you can start listening to some motivation music during the running sessions. Day 8-10. Jog – CW – jog in ½ - ½ - 1-mile ratio accordingly. Day 11. Rest The further you go into this challenge, the more professional your running should become. Now, you should start paying attention to your posture and running techniques that feel the most natural. Day 12. Jog for a mile. Be selective with your nutrition. If you want your body to burn fat and build up muscles instead, you should give it some materials to build them with. Look into your diet and try to plan meals and snacks that are nutritional and full of carbs. Day 13. Jog – CW – jog, 1 - ½ - ½. Day 14. Jog for a mile and a half. Day 17 – 18. 1.5 – 2-mile jog. Day 20. Jog for 2 miles. Day 21. Finish the challenge with your best result – 3 miles. Don’t push yourself too hard but try to end the challenge on a strong note. The 21 challenging day is behind, and now you have two options. You can stop with running if you’re satisfied with the result you’ve achieved in 3 weeks. Or you can keep on developing your skills and make running your new favorite free time activity. The choice is yours to make.